Stacey Eliason is instructor of horn at Edmonds Community College. Prior teaching positions have been at Central Washington University, Washington Academy of Performing Arts, and the Snoqualmie, Snohomish and Marysville School Districts. She performs regularly with the Mid-Columbia Symphony, THE CHOPPERS brass quintet, and was principal horn of the Issaquah Chamber Orchestra from 2009-2012, She has performed with the Seattle, Spokane, Tacoma, Olympia and Yakima Symphonies. She also travels as a recitalist in the Western United States and has served as the president of the Northwest Horn Society. She has performed solo recitals throughout the world on chamber music series such as Music at St. Michaels (Paris, France) and the Incline Village Chamber Music Festival (Lake Tahoe, Nevada). 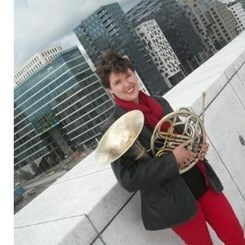 She performed in Brisbane, Australia as part of the International Horn Society 2010 Symposium and summer of 2013 was spent touring Norway. She enjoys promoting the horn’s solo repertoire and has commissioned and recorded music of composers such as Jeff Swingle, Brent Edstrom, Seth Stewart, Carey Zaines-Trader, Jeff Ball and Benjamin Gessel. She is a frequent adjudicator and clinician throughout the Pacific Northwest. Her former students have attended schools across the United States such as Indiana University (Bloomington), Boston University, Northwestern University (Chicago), and University of Colorado at Boulder and Pensicola College (Florida). They can also be heard in regional orchestras across the United States. Stacey holds music degrees from Indiana University and Central Washington University. She studied at the Paris Conservatory as an exchange student where she gained her love for modern music and solo brass repertoire. Request Lessons with Stacey today!